The weekend is almost over. Earlier today I had this entry almost completely finished and if you can believe it (it is true) I started closing windows looking for a chart I had downloaded on my desktop, and as you would figure, I closed the rough draft before I had published it....so let's start from scratch on this one once again. Come on guys, when I tell you I am an amateur, well you ought to believe it! If you are new to the blog, well, make yourself at home and look around. What I like to do on the blog is pick stocks (what else did you think?) and as a matter of honesty, and straight-forwardness (is that a word? ), I like to take some time each weekend and look back a year and find out how those particular stocks turned out. This analysis assumes a "buy and hold" approach to investing with equal dollar amounts being purchased of the stocks discussed. In reality, I practice and advocate a disciplined portfolio management that directs me to sell losing stocks quickly on small losses and to sell gaining stocks slowly and partially at targeted appreciation levels. Let's take a look at the stocks I discussed during the week of September 12, 2005, and find out how they would have turned out if they were indeed purchased! On September 12, 2005, I posted Oakley (OO) on Stock Picks Bob's Advice at a price of $18.16. Oakley closed at $22.75 on January 19, 2007, for an effective stock pick gain of $4.59 or 25.3%. On October 19, 2006, Oakley reported 3rd quarter 2006 results. For the quarter ended September 30, 2006, net sales increased 21.2% to $210.2 million, up from $173.4 million in the same quarter last year. Net income came in at $17.3 million or $.25/diluted share, up from $16.1 million or $.23/diluted share the prior year same period. Oakley (OO) beat expectations of $.22/share earnings on revenue of $192 million. In addition, the company raised guidance for revenue growth to 15 to 17% from prior guidance of an increase of 13%. Thus, the company showed strong revenue growth, earnings growth, beat expectations, and raised guidance. Everything contributing to what I call a "trifecta-plus" in earnings reports! On September 16, 2005, I posted Marine Products (MPX) on Stock Picks Bob's Advice when it was trading at $12.10. MPX closed at $9.58 on January 19, 2007, for a loss of $(2.52) or (20.8)% since posting. On October 25, 2006, Marine Products announced 3rd quarter 2006 results. For the quarter ended September 30, 2006, Marine Products reported net sales of $64.0 million a 1.6% decrease compared to the $65.0 million in the same quarter last year. Net income was $4.6 million a 37.2% decrease from the $7.3 million reported in the same period last year. 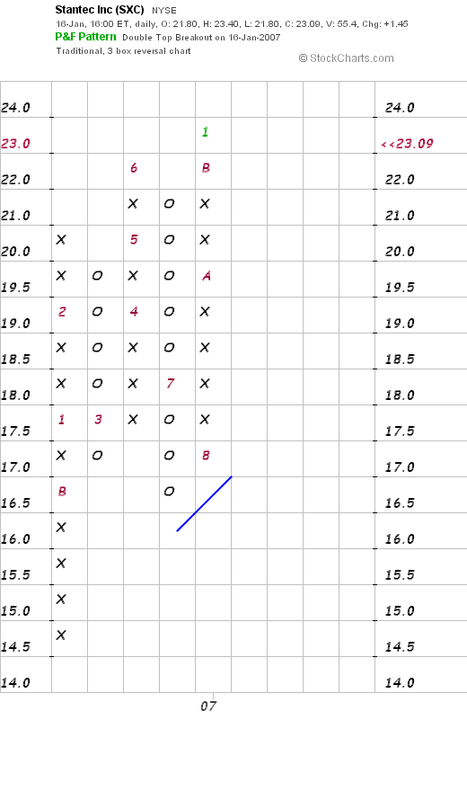 If we look at the chart on Marine Products from StockCharts.com, and my point of entry, you can see that I did pick the stock when it was already showing some technical weakness. Clearly I need to look closer at these charts as I present stocks. Perhaps this one could have been avoided (?). Well how did I do in that week in September, 2005, with these two 'picks'. Basically it was a wash with one stock moving higher and the other lower. In fact, the average performance of these two stocks was a gain of 2.25%. Thanks so much for stopping by and visiting my blog! If you have any comments or questions, please feel free to leave them on the blog or email me at bobsadviceforstocks@lycos.com. If you get a chance, be sure and visit my Stock Picks Podcast Website where I discuss some of the many stocks I write about right here! TGIF. It sure is great getting to Friday with the weekend ahead! I was looking through the list of top % gainers on the NYSE this evening and came across Schlumberger Limited (SLB) which closed at $61.00, up $3.10 or 5.35% on the day. I do not own any shares or options on this stock, although my wife does own about 60 shares of SLB in her IRA account. Let's take a closer look at SLB and I will try to walk you through some of the reasons why I believe it deserves a place on this website. "...operates as an oilfield services company in the United States and internationally. 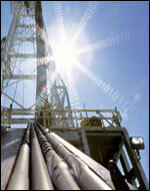 It operates in two segments, Schlumberger Oilfield Services and WesternGeco. Schlumberger Oilfield Services segment provides technology, project management, and information solutions to the petroleum industry. This segment offers exploration and production services, such as drilling and measurement; well completions and productivity; data and consulting; and well services required during the life of an oil and gas reservoir. WesternGeco segment provides reservoir imaging, monitoring, and development services. This segment�s services range from 3D and time-lapse (4D) seismic surveys to multicomponent surveys for delineating prospects and reservoir management." It was the announcement of 4th quarter 2006 results that drove the stock higher on Friday. Revenue for the fourth quarter ended December 31, 2006, increased 33% to $5.35 billion from $4.02 billion in the same quarter the prior year. Additionally, the company reported an 8% sequential increase from $4.95 billion in revenue reported in the preceding quarter. Net income was also up sharply at $1.13 billion, compared to $660.6 million in the prior year same period. On a per share diluted basis this came in at $.92/share, up sharply from $.54/diluted share last year. Importantly, the company beat expectations on both revenue and earnings. According to Thomson First Call, analysts expected earnings of $.85/share on revenue of $5.14 billion. Reviewing the Morningstar.com "5-Yr Restated" financials on Schlumberger shows how revenue actually dropped from $10.9 billion in 2001 to $9.7 billion in 2002. However, since that year, revenue has steadily increased to $14.3 billion in 2005 and $17.9 billion in the trailing twelve months (TTM). Earnings also dipped that same year from $.46/share in 2001 to a loss of $(3.99)/share in 2002. However, by 2003, the company was once again profitable reporting $.33/share in earnings, growing that to $1.82/share in 2005 and $2.63/share in the TTM. During this period of apparent restructuring, the company also initially decreased the number of shares outstanding from 740 million in 2001 to 579 million in 2002. However, by 2003 the company has 1.16 billion shares outstanding. This number has held stable with 1.18 billion shares outstanding in 2005 and the TTM. Schlumberger is a veritable cash machine, with $1.1 billion in free cash flow in 2003, dropping to $630 million before increasing to $1.4 billion in 2005 and $2.1 billion in the trailing twelve months. The balance sheet appears reasonable with $1.9 billion in cash and $6.09 billion in other current assets. This is balanced against the $6.2 billion in current liabilities and $4.9 billion in long-term liabilities. The current ratio works out to a satisfactory 1.28. Schlumberger is certainly a large cap stock with a market capitalization of $71.87 billion according to Yahoo "Key Statistics". The trailing p/e is a moderate 23.16, and the company is growing so quickly that the forward p/e (fye 31-Dec-07) works out to a nice 13.44. The PEG ratio (5 yr expected) is reported at 0.66. Generally PEG ratios between 1.0 and 1.5 are reasonable. Under 1.0 is 'cheap' and over 1.5 may be considered to be a rich valuation. According to the Fidelity.com eresearch website, the Price/Sales (TTM) works out to 3.74, slightly higher than the industry average of 3.16. Fidelity goes on to show that the Return on Equity (TTM) is at 39.87%, higher than the industry average of 30.89%. Finishing up with Yahoo, we can see that there are 1.18 billion shares outstanding with 1.14 billion that float. Currently as of 12/12/06, there are 26.21 million shares out short, representing 2.3% of the float or a short ratio of 3.3. The company pays a forward annual dividend of $.50/share, yielding 0.8%. The company last had a 2:1 stock split on April 10, 2006. Reviewing the StockCharts.com "Point & Figure" chart on Schlumberger, we can see that the stock traded beteween $29 and $17 between 2002 and 2004. In early 2004, the stock moved higher climbing as high as $74/share in May, 2006. Since that time the stock has traded in a tight range between $55 and $70. 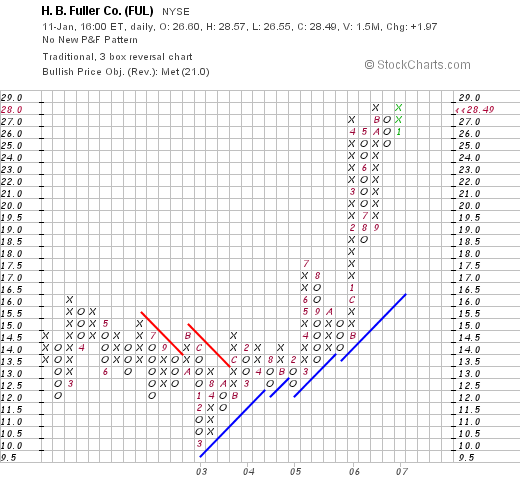 The stock price has come back to the 'support line' and appears poised to move higher. Note the series of higher short-term lows. Please note that my wife does have a few shares (less than 100) in a retirement account. But besides that, the company reported a strong quarter on Friday. The company is confident it can handle any decline in the price of oil, but certainly that will affect exploration activity. Otherwise, besides the possibile cyclical nature of the oil business, this is a very pretty picture with strongly growing revenue, earnings, and stable stock shares. Valuation appears reasonable with a p/e in the low 20's and a PEG under 1.0. Finally the chart does not appear overextended. Even though this is a large cap stock, I like this company and will keep it in my vocabulary of investment possibilities. Thanks again for stopping by and visiting! If you have any comments or questions, please feel free to email me at bobsadviceforstocks@lycos.com or go ahead and leave your comments right on the blog. If you get a chance, stop by and visit my Stock Picks podcast site. This afternoon, I was looking through the list of top % gainers on the NYSE and came across a name that I had noticed once before on the list a week or two back, Stantec (SXC) which, as I write, is trading at $23.29, up $1.65 or 7.62% on the day. I do not own any shares or options on this company. Let me try to review a few of the things that led me to pick this stock this afternoon for this review. "...provides consulting planning, engineering, architecture, interior design, landscape architecture, surveying and geomatics, environmental sciences, project management, and project economics services for infrastructure and facilities projects in North America." How did it do in the latest quarter? On November 2, 2006, Stantec reported 3rd quarter 2006 results. Gross revenue for the quarter ended September 30, 2006, increased 43.9% to C$210.2 million from C$146.1 million in the same period in 2005. Diluted earnings increased 12.5% to C$.36 vs $.32 in the same 2005 quarter. Apparently the company has issued some additional shares causing some dilution of earnings. As the report relates, "Earnings per share reflect an additional 5.9 million average number of shares outstanding compared to the third quarter of 2005." Checking the Morningstar.com "5-Yr Restated" financials on Stantec, we find that revenue, which was $276 million in 2003, increased to $345.9 million in 2004 and $433.5 million in 2005. Earnings per share during this period have increased from $.46/share in 2003 to $.82/share in 2005. Shares outstanding have also increased from 37 million in 2003 to 40 million in 2005 and 45 million in the trailing twelve months (TTM). Free cash flow, which was a negative $(8) million in 2003 turned positive at $46 million in 2004 and was $33 million in 2005. The balance sheet on Morningstar.com appears adequate with $24.1 million in cash and $215.6 milllion in other current assets. This is enough to cover both the $134.9 million in current assets in addition to the $105.1 million in long-term debt combined. Calculating the current ratio, we get a figure of 1.78, suggesting adequate current assets to cover current liabilities with assets to spare. What about some 'valuation' numbers? Looking at Yahoo "Key Statistics" on SXC, we find that this is a mid cap stock with a market capitalization of $1.04 billion. The trailing p/e is a moderate 23.39, no forward p/e and no PEG is reported. Yahoo reports the company with a Price/Sales ratio of 1.66. There are 45.08 million shares outstanding with 42.97 million that float. As of 12/12/06, there were 14,390 shares out short representing 1 day of trading of average volume (the short ratio). No dividend is paid and the stock split 2:1 as recently as May 31, 2006. 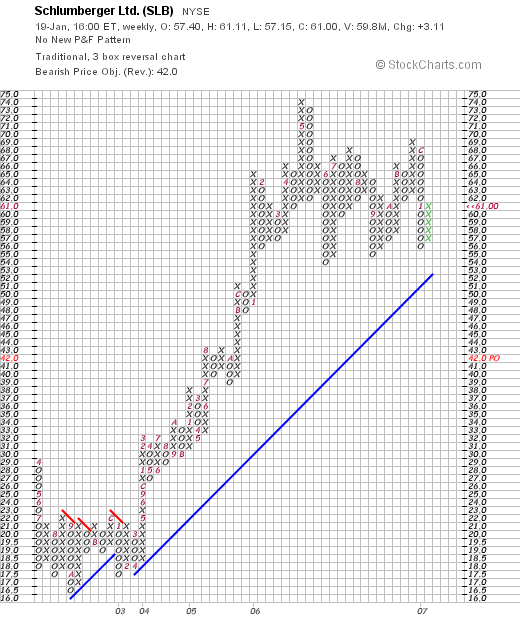 Looking at a "Point & Figure" chart on Stantec, we can see a fairly short period of trading but the chart looks adequately strong considering the duration. This is an interesting Canadian company in the consulting business with nice numbers being reported. They had a great quarter and the Morningstar.com site shows the fairly steady revenue and earnings growth, the positive free cash flow, and the reasonable balance sheet. Valuation analysis is limited, as I don't have a PEG on the stock nor a forward p/e. Fidelity.com doesn't help me with any ROE or Price/Sales comparison. But the chart is good. I probably wouldn't be personally jumping in on this stock if I did have the "permission" to add a new position only because of the difficulty getting all of the data I like to have to evaluate a stock. But so many of the other numbers and information is encouraging, that I believe this stock should be in the "vocabulary" of this blog. Perhaps to be acquired at a future date! Thanks again for stopping by and visitiing! If you have any comments or questions, please feel free to leave them on the blog or email me at bobsadviceforstocks@lycos.com. Also, be sure and visit my Stock Picks Podcast Site.